Jacqueline loves to teach, but unfortunately she has not always the opportunity to fly to the States. That's why Jacqueline trained those lovely ladies to teach her classes for her. Lisa and Megan for the USA; Anne, Maureen and Melanie for Canada and Katja for Germany are highly qualified to teach the BeColourful classes. Scroll down, and you'll find all the relevant information below. Lisa stitched her first quilt more than fifteen years ago when her sister invited her to a mystery quilt weekend and she has not looked back since. She has completed numerous quilts and began teaching friends and acquaintances how to quilt ten years ago while living in New Jersey. Her intense love of quilting is infectious and she has led many novices and beginners in weekly quilting classes while living in New Jersey, and has continued these efforts since moving to New Hampshire in 2008. Lisa’s love of dramatic colors and bold tones are evident in her everyday life and she was naturally drawn to BeColourful quilts when she first saw them. 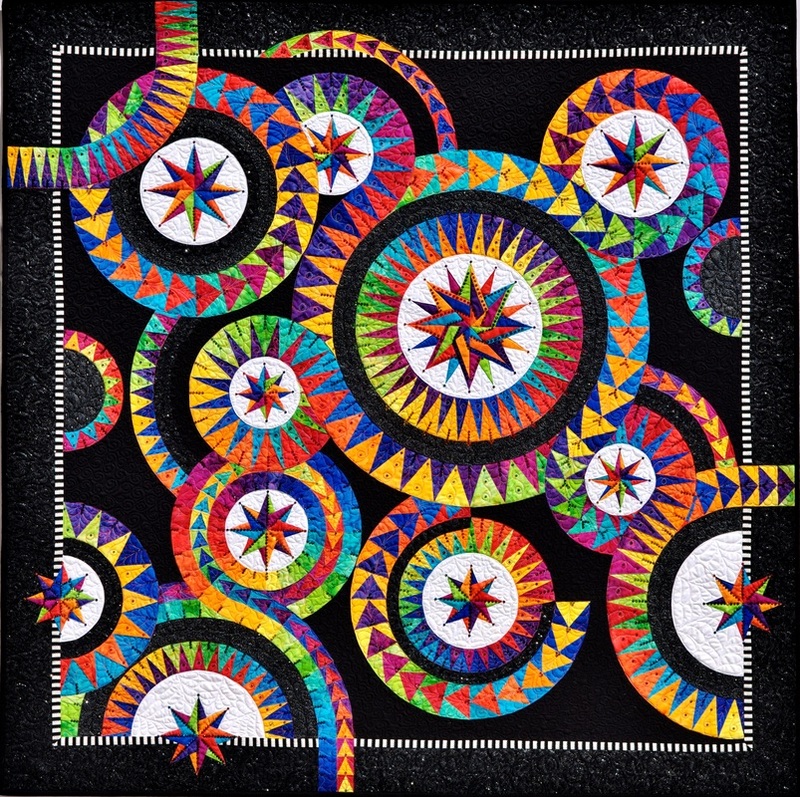 Lisa has completed multiple BeColourful quilts and her first BeColourful quilt, which was Circle of Life, won a Blue Ribbon at Maine Quilts 2014 in addition to The National Quilting Association Certified Judge - Award of Merit. There are always multiple BeColourful quilts in various stages being worked on in her studio. This experience gives Lisa a complete command of all of the major quilting techniques used to create Jacqueline’s amazing paper pieced quilts. In October 2013, Lisa attended a Master’s Class with Jacqueline de Jonge, quilt designer and owner of BeColourful from The Netherlands. During this master’s class Lisa’s love of vivid color, which Jacqueline uses in many of her quilts, was ignited. The paper piecing and construction techniques Jacqueline taught were ingenious and fit right into Lisa’s teaching toolbox. Her love of teaching and sharing information lead Lisa to approach Jacqueline and BeColourful about teaching for them here in the United States. In late December 2013, Lisa was given authorization to teach on behalf of Jacqueline and BeColourful throughout the Northeastern US. Lisa continues to learn new BeColourful patterns and techniques along with learning new ideas, processes and shortcuts to share with other quilters. Lisa’s love for quilting, and her easy going, friendly personality is ideal for beginning quilters as they learn to do BeColourful patterns. 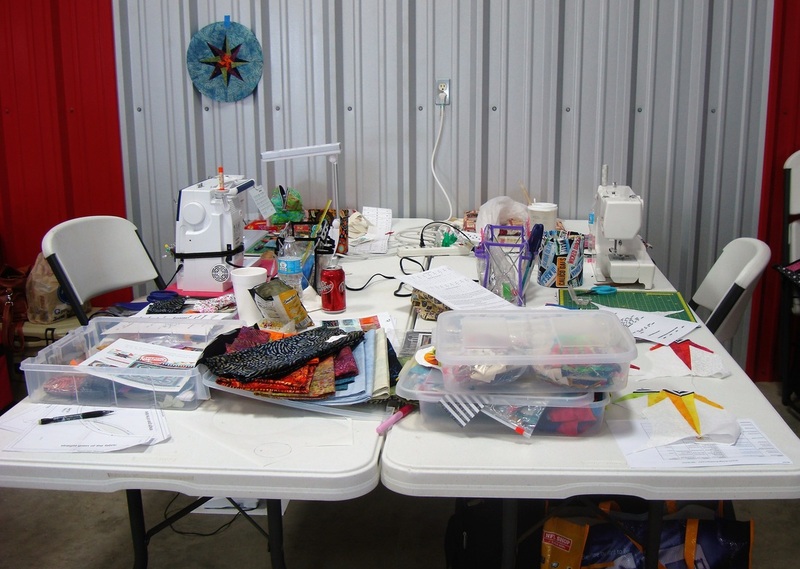 She also has the depth and breadth of quilting experience to bring experienced quilters further along in their quilting journey. Lisa has more than fifteen years classroom education experience working in public school systems which gives her a strong background in breaking down the more complex quilting techniques into easy to understand steps. 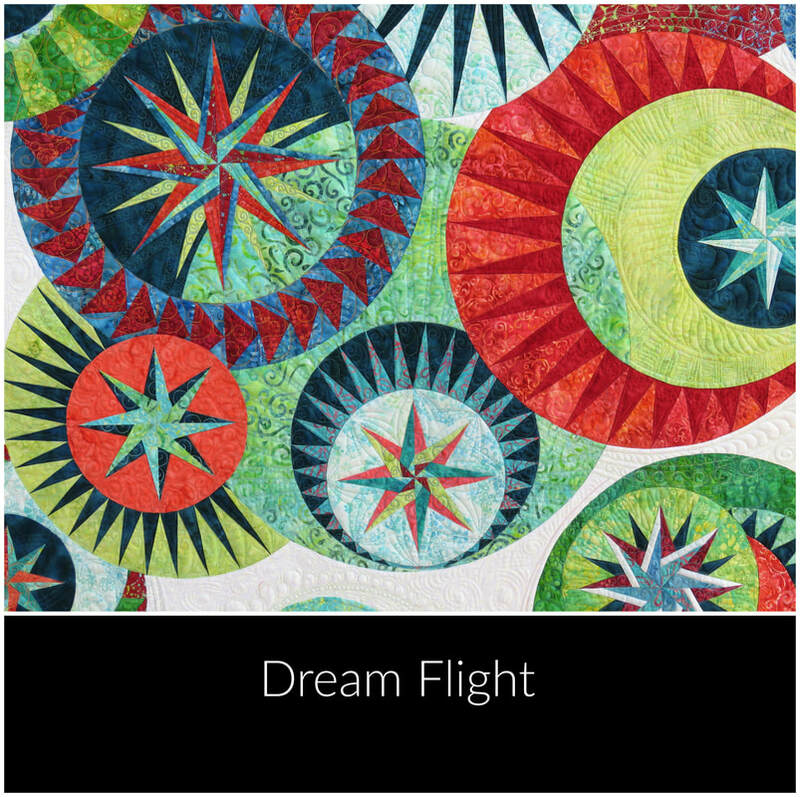 Lisa is the owner of Compass Point Quilts & CPQ Studio, located in East Kingston, New Hampshire, which focuses on teaching BeColourful & Judy Niemeyer quilt patterns and can be described as an enthusiast of this art form. She has been a certified instructor for Quiltworx for the past three years. 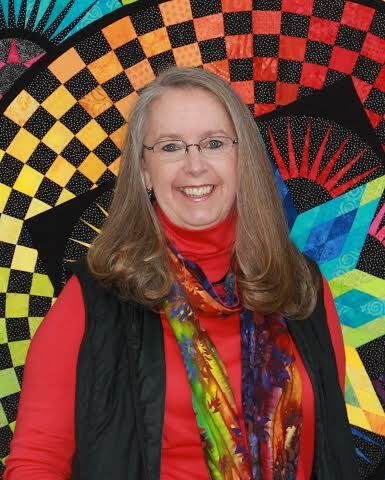 Lisa is a member of the Merrimack Valley Quilt Guild, Plaistow, NH; Seabreeze Quilt Guild, Exeter, NH; The New England Quilt Museum, Lowell, MA, NH State Quilters Association, Concord, NH, and The National Quilting Association. Her geographic focus is the Northeastern US and New England regions, but is available as needed to travel and teach anywhere in the United States. How tempting this is! A series of workshops! Working together with Lisa as your teacher on this amazing quilt. 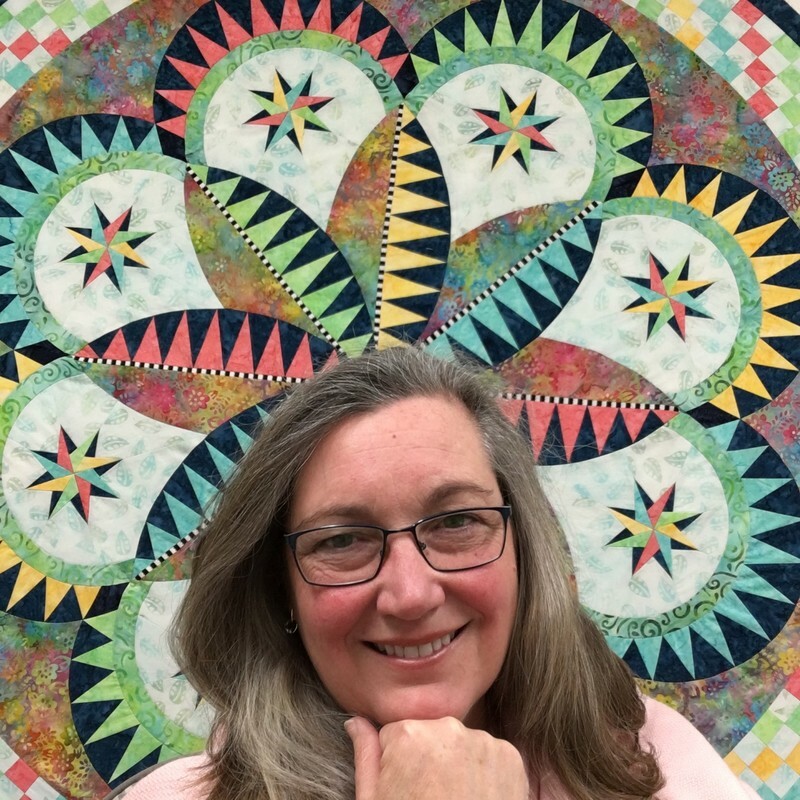 Lisa will be teaching "Happiness", a perfect beginners project during Maine Quilts 2019.
stay tuned for more infoemation about the workshops. 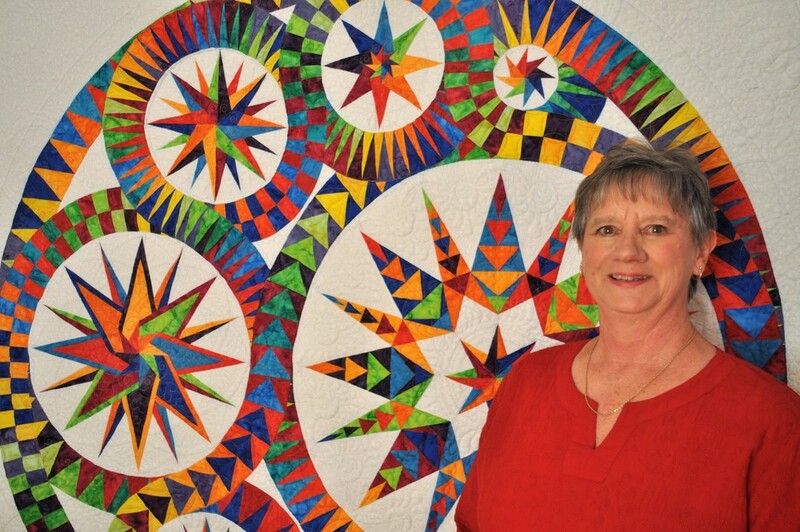 ​Quilting has been a part of Megan’s life since she was a little girl. She would sit, watching her mom piece, and help out by seam ripping, ironing and cutting apart chain pieced blocks. 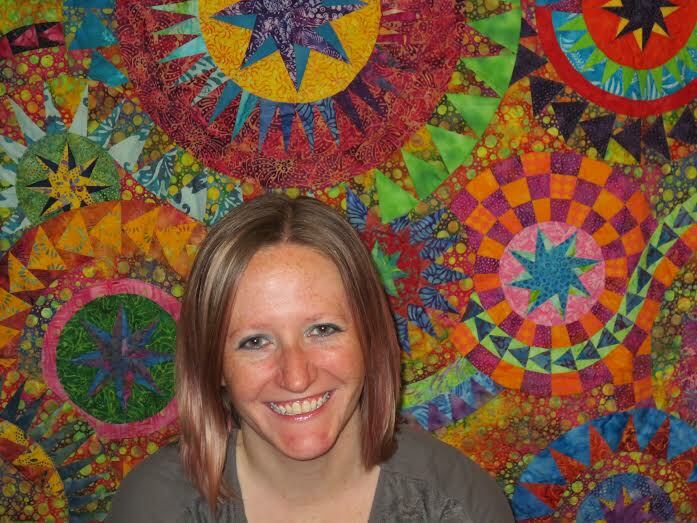 Megan took her first quilting class in middle school and became hooked on the art. When Megan graduated from college, she received her very own sewing machine to pursue her growing passion. In 2008, she moved from Ohio to Houston, Texas where she discovered a shop carrying the BeColourful patterns and fell in love! Since then, she has taken several classes from Jacqueline and completed many BeColourful quilts! With encouragements and blessings from Jacqueline, Megan began teaching BeColourful classes and workshops in February of 2014. Her classes have included Happiness, Jewel and Fly Away. Megan continues to explore the design possibilities in Jacqueline’s patterns and methods, along with teaching basic paper piecing in the greater Houston area. She is excited to introduce others to the world of BeColourful quilts! 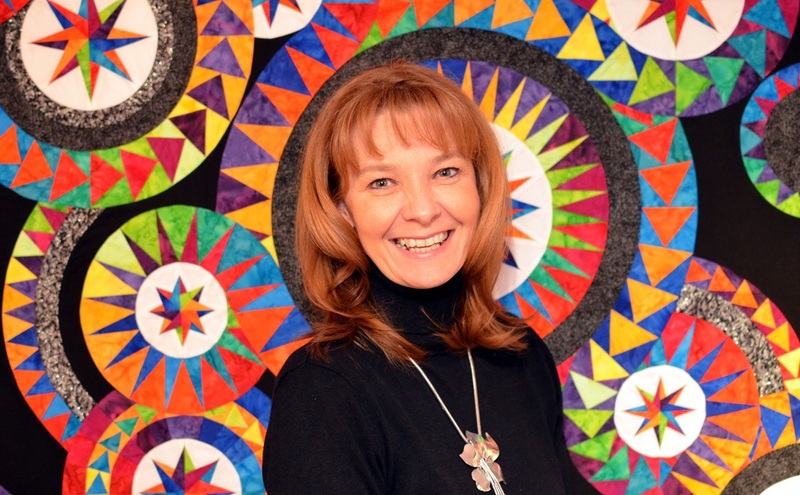 ​Megan would love to teach at your quilt guild or shop. Megan can be contacted via email at megan@hollingshead.com. This is open to anyone who has taken a BeColourful Class and wants to work on their quilt. Megan will be there to answer any questions or help with any problems. It’s a great time to sew with other quilters also working on BeColourful quilts! Attend as many or as few as you’d like. This is the last 'sit-and-sew' date for this season: January 12, 2019. Megan will be on maternity leave for a couple of months in 2019. We will let you know when she scheduled her next classes! ​Anne discovered quilting when she emigrated to Canada in 2008 with her husband, dog and reluctant teenager, and has never looked back. Her love of stitching was imparted to her by her late mother, and frequent rain-drenched summer holidays in a caravan in Switzerland provided plenty of opportunity for her to learn embroidery skills. Anything to keep her quiet ...! During Anne’s working life as a primary school teacher in the UK, she continued to do hand sewing, although she was still unaware of the world of quilting that was to open up to her after her move to Canada. On arrival in Fernie, BC, she quickly discovered the local quilt shop, and thus her quilting journey began. Her husband, David, has realized that resistance to her fabric fervour is futile, and lovingly encourages her every stitch, unless it involves buying more fabric (“do you REALLY need more?”). As a previous hand-stitcher, she made many hand-appliqued quilts, before discovering the joys of foundation paper piecing. She loves the intricacy, challenge and accuracy of this method, and trained as a Quiltworx instructor in 2015. Over the years, Anne has developed her sense of colour from “safe and earthy” to rich and vibrant colour choices, and her journey into developing her own confidence in her colour choices inevitably led to her instant connection with the vibrant and even more intricate designs of the Be Colourful quilts, which led to her connection with Jacqueline de Jonge. Anne is the owner of Sew Peaceful Quilting, located in Nanoose Bay, BC, where she teaches from her studio. She also teaches across BC and Canada. Her incredible patience, clear instruction and, of course, wonderful English sense of humour seem to both relax and inspire her students. Fancy a spring break in beautiful Tahsis on the west coast of Vancouver Island for a 3 day workshop with BeColourful Authorized Teacher, Anne Hall? www.sewpeaceful.com for more info! After admiring quilt magazines in grocery stores for years, Melanie finally worked up the courage to make her first one in 1998. She had a borrowed sewing machine and absolutely no knowledge of quilting, whatsoever. The results were predictably disastrous, yet she was completely and immediately hooked. In the twenty years since she has become an extremely adept and ambitious quilter, always willing and excited to try new techniques and tools. What started as a hobby has turned into a lifelong passion. 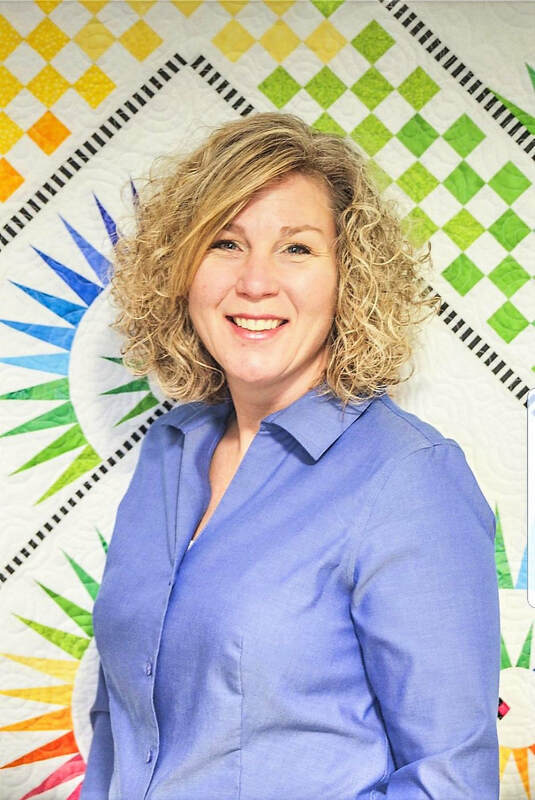 Melanie is always making quilts, talking about quilts, admiring quilts, looking at patterns, petting fabric, going to quilt shows, or packing to go on retreats with friends who are equally obsessed passionate about quilting. There is only one thing Melanie enjoys as much as quilting and that is encouraging others in their pursuit of the art. As a former corporate workshop facilitator, Melanie strives to create a learning atmosphere that is welcoming, fun, and encouraging. She wants all students to leave her courses feeling empowered and proud of their efforts. While she enjoys teaching all forms of quilting, her favourite by far is paper piecing the BeColourful way. She saw her first BeColourful quilt online in 2011 and became determined to one day make them all! She has attended several of Jacqueline’s courses and is extremely proud and honoured to be an Authorized BeColourful Teacher. Melanie lives in beautiful Ottawa, Ontario and is available to teach in Central and Eastern Canada. Follow her on Instagram at melaniemmacdonald or on her blog at lazylabquiltcompany.blogspot.com. Stitch By Stitch in Kingston, Ontario. Since Katja was a little girl she has been learning various techniques of handcrafts as knitting, crocheting and even stitching. By the age of 14 she got her first sewing machine and started off making dresses on her own. In 1994 she discovered quilting. Since then she made lots and lots of quilts. 2007 she finally made her first BeColorful Quilt; The Blooming Tale. She has been especially taken with the Quilts of Jacqueline’s.Since then she has even completed more Quilts. Within the last years Katja started giving courses and found out that more people than she thought love the BeColourful Quilts but are too afraid to make one. It makes her happy to see how the course members lose their fear and to demonstrate, that - if they are able to paper piece and can control precise sewing - they will be able to make their own BeColourful Quilt without too many efforts. As many Quilter’s are not as comfortable with English, Katja is pleased to convey Jacquelines techniques in German speaking areas, she lives in Bremen, Germany. She would be delighted if you shared her interest. Mit 14 Jahren bekam sie ihre erste Nähmaschine geschenkt und nähte zunächst Kleider. 1994 entdeckte sie dann das Quilten für sich. Seitdem hat sie viele Quilts fertig gestellt. Ihren ersten BeColourful Quilt machte sie 2007: Blooming Tale. Die farbenfrohen Quilts von Jacqueline haben es ihr besonders angetan. Inzwischen hat sie mehrere Be Colourful Quilts gefertigt. Während der letzten Jahre hat Katja angefangen auch Kurse zu geben. Dabei hat sie festgestellt, dass viele Quilter die Be Colourful Quilts umwerfend finden, sich aber nicht trauen, selber einen zu nähen. Katja bereitet es Freude den Kursteilnehmern die Angst vor der Herstellung dieser Quilts zu nehmen und ihnen zu zeigen, dass jeder, der schon einmal auf Papier genäht hat und präzise arbeitet, seinen eigenen Be Colourful Quilt nähen kann. Da viele Quilter nicht so sicher im Umgang mit der englischen Sprache sind, freut sich Katja, die Techniken von Jacqueline im deutschsprachigen Raum vermitteln zu können. Sie lebt in Bremen, Deutschland. Wer Interesse an einem Kurs hat, kann hier mit Katja Kontakt aufnehmen.